This show is for Mustangs and other Ford powered vehicles. MODIFIED. 1964 1 to 2007 Mustangs will be judged using Abbreviated MCA Judging Sheets. The Category for 08-17 Mustangs, as well as all other Ford powered vehicles is PARTICIPANT CHOICE. *Registration fee will be $25.00 for entries received before May 1, 2018. 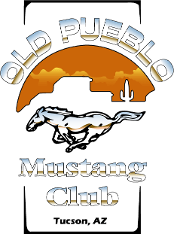 To encourage greater banquet participation the Rio Grande Mustang Club has reduced the price this year to $25.00. order by MAY 12th. A banquet headcount is due MAY 23rd, the Wednesday before the show starts. 2. When making room reservations, be sure to tell them it’s for the Rio Grande Mustang Club car show. lost, or stolen property arising from this event. For hotel reservations: 1-800-262-2043 Make sure you mention Rio Grande Mustang Club for the special $99 rate.  6 PM Sunday May 28th awards banquet in the Kokopelli room with door prizes and awards. banquet that everyone will want to participate in. The price for this year’s banquet has been set at $25.00. trophies based on participant balloting. Thirteen classes are planned for the Participant Choice category.  No “for sale” signs on or around any cars except in the Pony Corral. No radios or other music playing.  Please use the trash containers provided, don’t leave trash behind.  There is no water hose at the hotel to wash your car.  Alcoholic beverages, tents or large umbrellas are not permitted in the show area. judge’s helper, it helps to learn how to judge. It can also answer questions you may have about judging. 1. Hoods and trunks open (hoods closed on Daily Driven). 2. Convertible tops up. Display top boot in the trunk. Windows closed (You may open windows an inch or two). 3. FIRE EXTINGUISHER IS REQUIRED! May be displayed inside or in the trunk. 4. Display jack and jack handle as you prefer in the trunk. 5. No signs or displays around cars. Only Modified may use mirrors. 6. Please remove floor mats and all other personal items from interior and trunk. 1. Cars may be displayed as you desire. 2. Participant ballots will be used for winner selection.